Three critical elements combine in a lawn mower small engine to allow it to start and run. If the lawn mower has spark and gas it's still missing the crucial air element. Air mixes with the fuel for better combustion and it also keeps the engine cool enough for continued combustion. 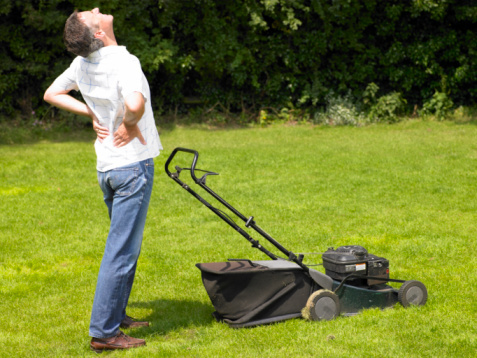 If the lawn mower has spark and gas, check the air supply. A dirty air filter will slowly suffocate your engine, and eventually the filter will not let any air in for combustion to begin. Dust, grass clippings and other particulate matter constantly get trapped inside the foam filter pad. If this pad doesn't receive regular cleaning, the carburetor will not have air to mix with the fuel. Clean the air filter according to your lawn mower's specifications after every 10 hours of operation. Clean the air filter more frequently if it's used in dusty and dirty conditions. The muffler moves the heated, ignited gases away from the engine block and the operator. This allows the engine to stay cool enough to keep the combustion process going. However, if the heated gases can't escape out the muffler, the heat will build and eventually shut down the engine. Open the muffler cover and remove the spark arrester screen. This screen will trap ignited gases but it will also trap all the carbon, which can build up on the screen and stop the airflow. The recoil starter on a lawn mower allows the operator to manually crank the engine fast enough to get combustion started. This recoil mechanism includes the starter rope, pulley, recoil spring, flywheel and ignition module. These parts must interact to get the crankshaft and flywheel spinning fast enough. Remove the recoil starter cover and inspect the starting components for any damage. Always turn the ignition off, take out the key and the spark plug and ground the ignition wire to prevent electrocution. If gas, spark and air are all present in the right combinations at the right time, and the mower still doesn't start, check the engine for proper compression. Compression gives the engine enough vacuum pressure to keep the moving parts moving and the systems working. If the engine loses this compression, the fuel will stop flowing and the crankshaft will stop spinning. Use a compression gauge hooked into the cylinder to test for compression loss.